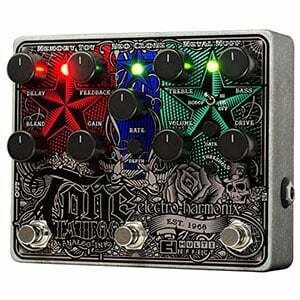 Tone Tattoo brings out the side of Electro-Harmonix which they don’t often show. This is true both in terms of the performance of this incredible multi-effect pedal, and in terms of its aesthetics. To some, it was hard to associate the sound coming from their amps to the brand whose logo was printed on the enclosure. This is no vintage overdrive we are used to. This is pure gain crazed dist box that comes packing additional heat. Because of this twisted character, it has earned its place among the best multi-effects pedals on the market. Pit simply, this thing is the epitome of organized chaos. Once you unpack the Tone Tattoo from its box, you will notice two things. First is that Electro-Harmonix once again used their classic metal enclosure. The other is that the graphical design on the face of the Tone Tattoo looks like nothing Electro-Harmonix has released up to this point. There’s a lot going on there, to a point where it is hard to read the lables of the knobs. Needless to say, that is pretty unusual for EH. With that said, if yo ulook hard enough, you will see that the three effects this pedal brings are all color coded. Those effects are the Metal Muff distortion, Neo Clone chorus cluster and Memory Toy analog delay. When it comes to controls, Electro-Harmonix kept things relatively simple. One look at the layout of the knobs will tell you that the accent was put on the Metal Muff distortion and Memory Man delay clusters. Both of these come with four standard controls we are used to seeing on effects of this type. Neo Clone is a different story. With a footswitch and a single knob, it doesn’t take much to conclude that its function is fairly limited. However, it is there so we are not complaining. The pedal sounds pretty much like it looks – very aggressive no matter what setting you dial in. Metal Muff distortion is a true piece of work. At times, it can be pretty hard to wrangle as it likes gain very, very much, but it is also one of the most organic sounding distortions out there. Chorus, despite its ever simplified circuitry, actually works as intended. Sure, you don’t get a lot of maneuvering space to work with, but it definitely works. Finally, the analog delay sounds just as you would imagine it would. It’s a proper vintage delay that brings a no nonsense effect to the table. it so good. Sure, it is not as versatile as some other Electro-Harmonix models, but it wasn’t really meant to be anyway. We are looking at a pretty surgical tool that is designed to deal with a specific set of parameters. As such, it is pretty awesome. For more info about the Electro-Harmonix Tone Tattoo, click here.